Request Online Apartment Community Reviews with Our Quick and Convenient New Feature! Online review sites are increasingly influencing consumer behavior. According to a Search Engine Land Study conducted in July of 2014, nearly 88 percent of consumers trust online reviews. That number is up 9 points from 79 percent in 2013, and 16 points from 72 percent in 2012. With such significant strides over the past two years, there’s no reason to believe this trend will slow down soon. It is with these statistics in mind that Respage has added yet another feature to our already heavy arsenal of online reputation management tools for apartment management companies. Unveiled on March 18, this new feature allows apartment managers to send review requests to current and previous tenants via an email tool within the Respage dashboard. To save our clients time and resources, all email copy is automatically generated, though users have the option to edit the subject line and body content if they’d like. Links to review sites are also generated automatically, and are based on whichever review sites users have connected to their Respage accounts. 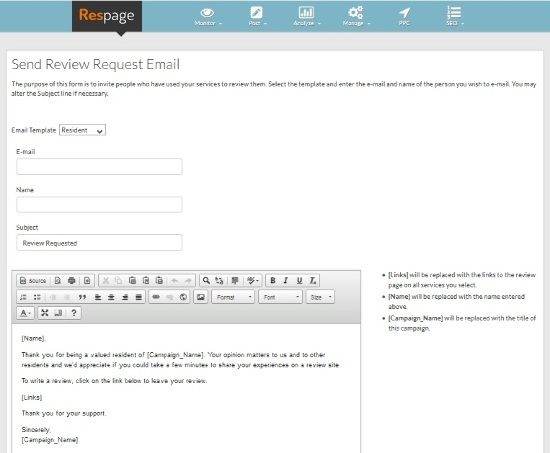 Current users can find the Email Request for Online Review form under the Manage tab of the Respage dashboard. To generate email copy, simply select an email template from the top drop down menu. After the copy appears in the content box, just fill out the resident names and email addresses. Links to review sites will be automatically placed in the email based on the checkbox selections at the bottom of the form. Due to the growing influence of online review sites, the Respage team has been working hard to develop more and more online reputation management tools for the multifamily industry. To protect your online reputation and learn more about our ORM services, visit the ORM product page on Respage.com or reach out to one of our friendly representatives today.